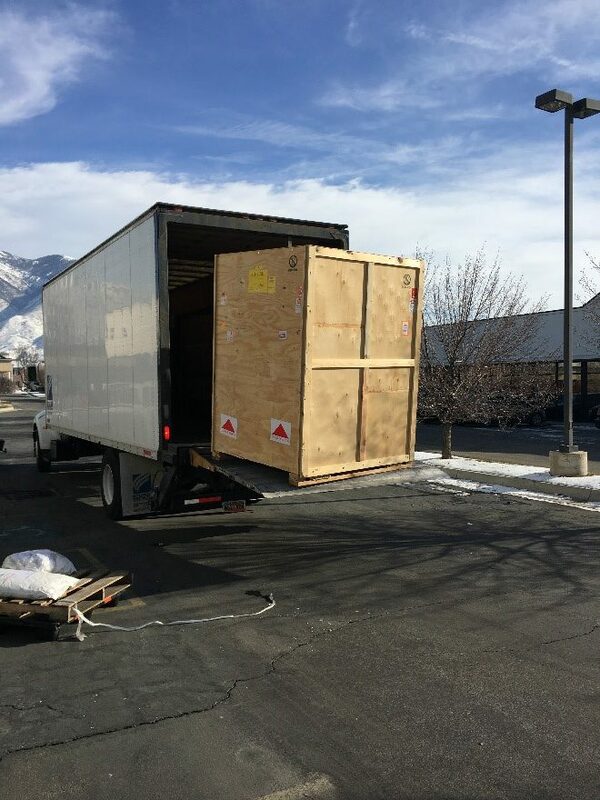 It has been an exciting month here in our Draper Utah lab, as we have received and installed our new FEI Teneo FEG SEM. We are a small lab, focusing on EBSD development and applications, and without a loading dock, so timing is critical when scheduling the delivery. So, 3 months ago, we looked at the calendar to pick a day with sunshine and without snow. Luckily, we picked well. Figure 1: Our new SEM coming off the truck. Once we got the new instrument up and running, of course the next step was to start playing with it. 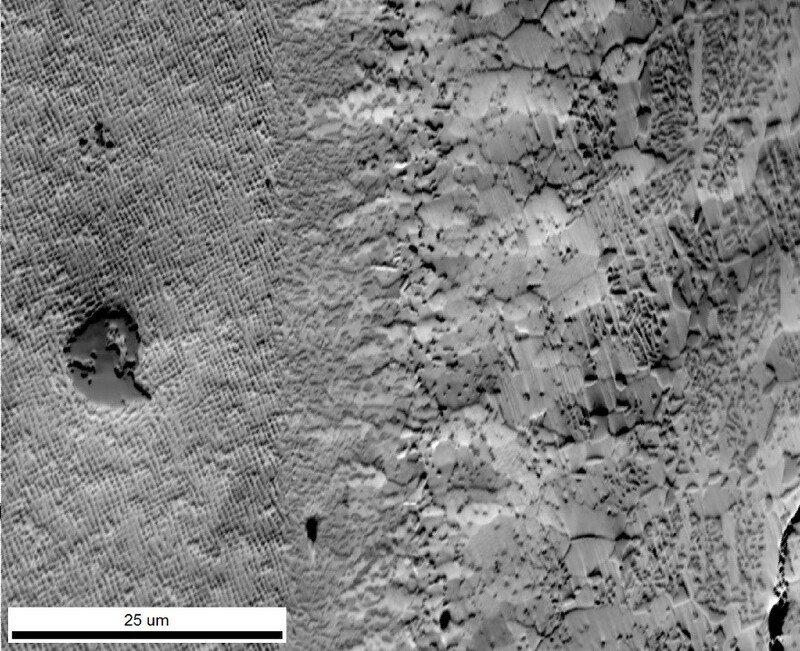 This new SEM has a lot more imaging detectors than our older SEM, so I wanted to see what I could see with it. 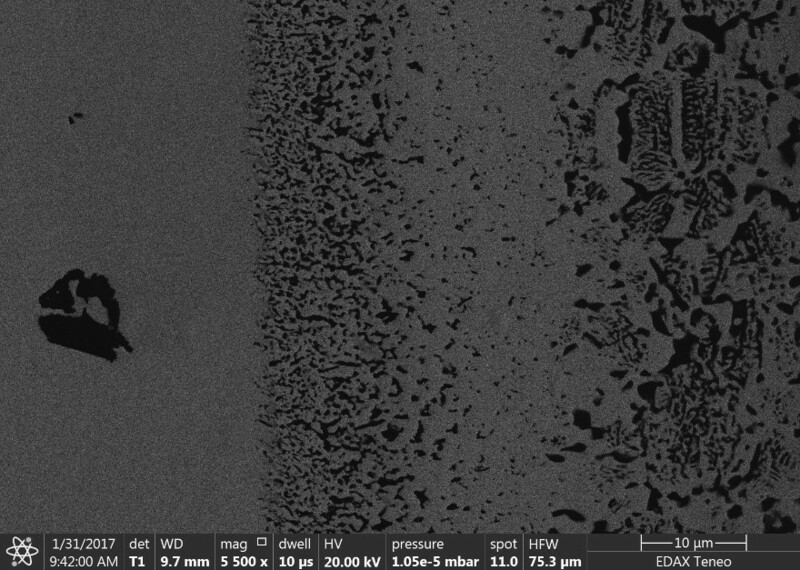 I chose a nickel superalloy turbine blade with a thermal barrier coating, as it had many phases for imaging and microanalysis. The first image I collected was with the Everhart-Thornley Detector (ETD). For each image shown, I relied on the auto contrast and brightness adjustment to optimize the image. With imaging, contrast is information. The contrast in this image shows phase contrast. 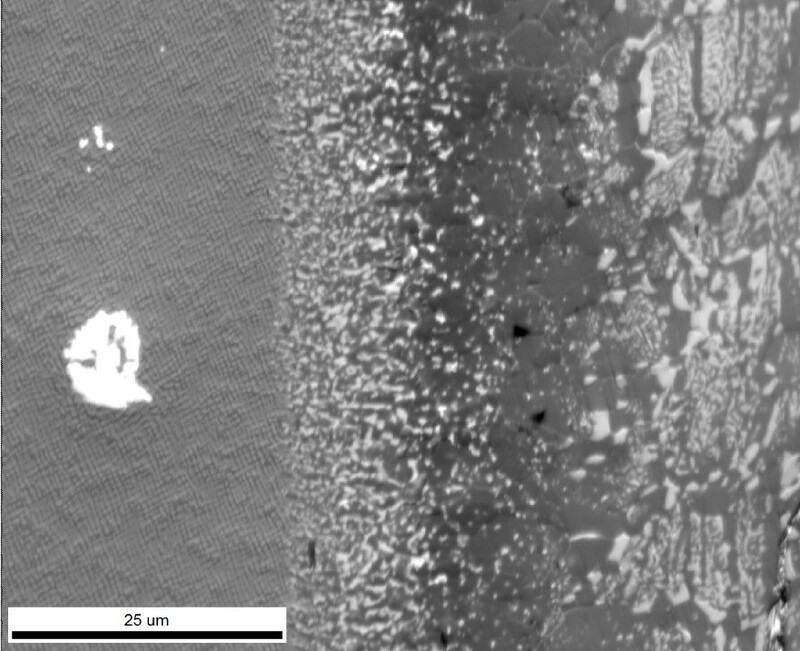 On the left, gamma/gamma prime contrast is visible in the Nickel superalloy while different distinct regions of the barrier coating are seen towards the right. The next image I collected was with the Area Backscatter Detector (ABS). This is a detector that is positioned under the pole piece for imaging. With this detector, I can use the entire detector, the inner annular portion of the detector, or any of three regions towards the outer perimeter of the detector. Figure 3: ABS Detector image. I tried each of the different options, and I selected the inner annular ring portion of the detector. Each option provided similar contrast as seen in Figure 3, but I went with this based on personal preference. The contrast is like the ETD contrast is Figure 2. I also compared with the imaging options using the detector in Concentric Backscatter (CBS) mode, where 4 different concentric annular detectors are available. Figure 4: T1 Detector (a-b mode). My next image used the T1 detector, which to my understanding is an in-lens detector. In this mode, I selected the a – b mode, so the final image is obtained by subtracting the image from the b portion of the detector from the a portion of the detector. I selected this image because the resultant contrast is reversed from the first couple of images. Here phases that were bright are now dark, and detail within the phases is suppressed. 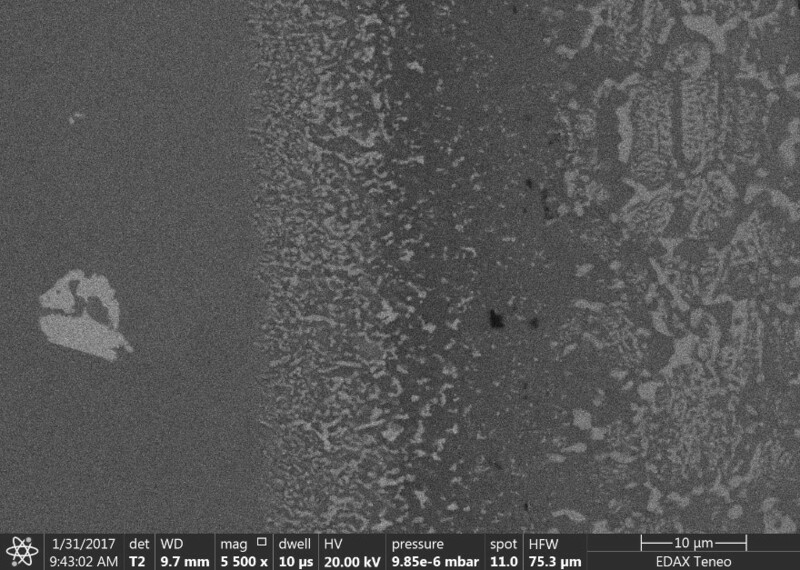 My final SEM image was collected with the T2 detector, another in-lens detector option. Here we see the same general phase contrast, but the contrast range is more limited and the detail within regions is again suppressed. I have chosen to show this set of images to illustrate how different detectors, and their positioning, can generate different images from the area, and that the contrast/information obtained with each image can change. Now I have done a cursory interpretation of the image contrast, but a better understanding may come from reading the manual and knowing the effects of the imaging parameters used. Figure 6: Always Read the Manual! 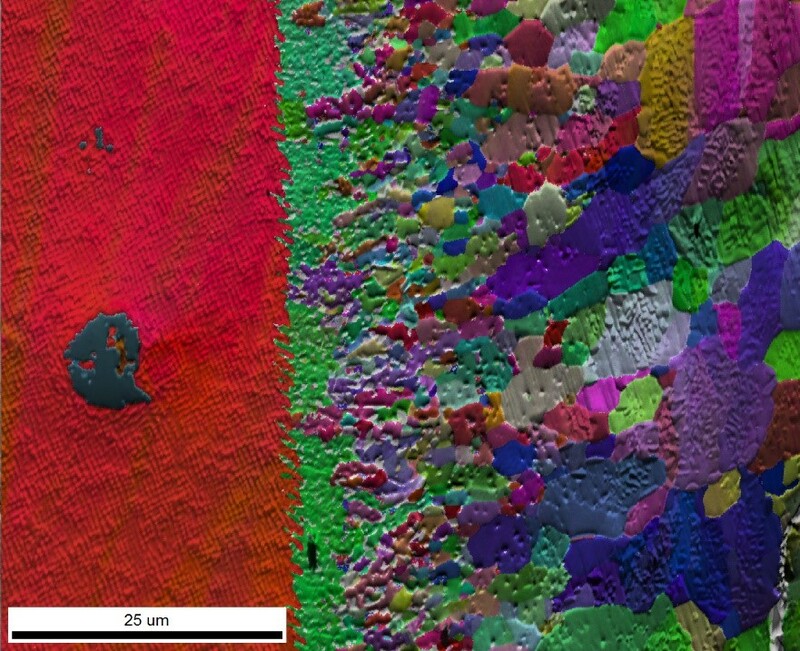 Of course, I’m an EBSD guy, so I also want to compare this to what I can get using our TEAM™ software with Hikari EBSD detectors. 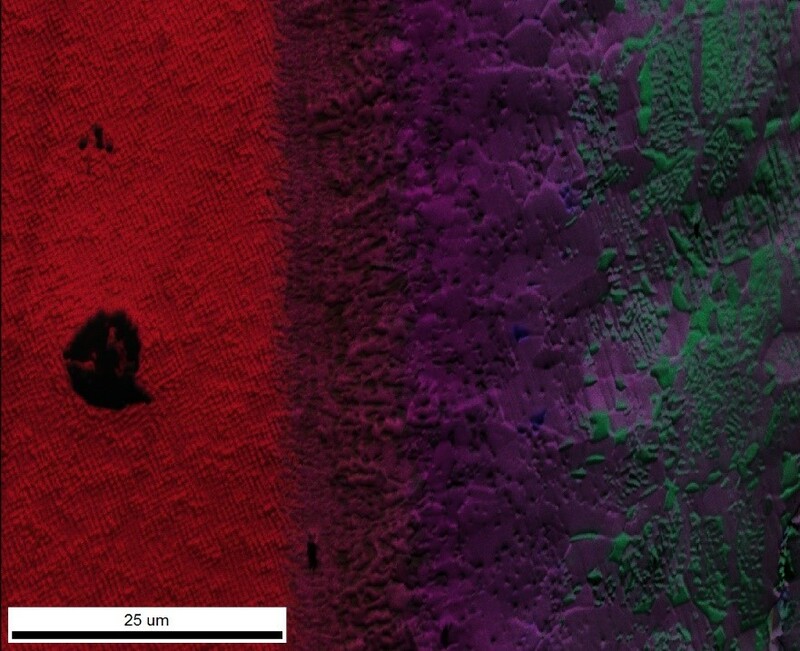 One unique feature we have in our software is PRIAS™, which uses the EBSD detector as an imaging system. With the default imaging mode, it subsets the phosphor screen image into 25 different ROI imaging detectors, and generates an image from each when the beam is scanned across the area of interest. 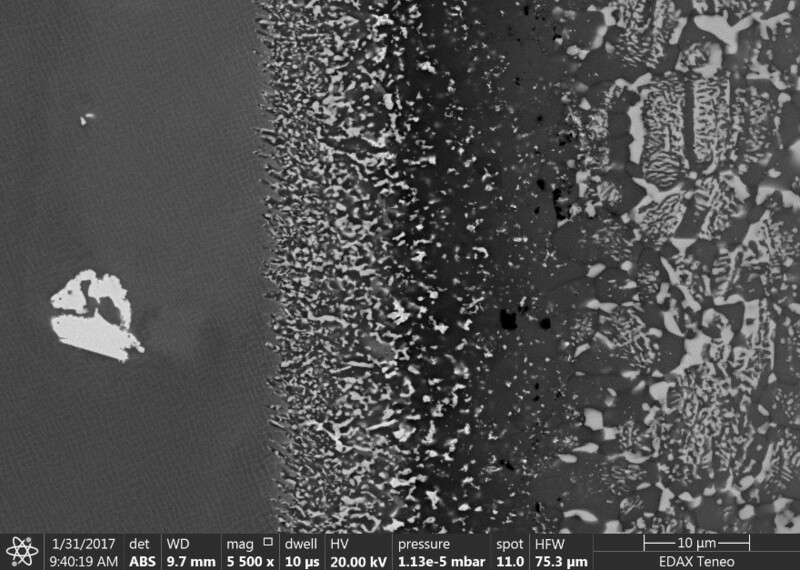 Once these images are collected, they can be reviewed, mixed, added, subtracted, and colored to show the contrast of interest, similar to the SEM imaging approach described above. The 3 most common contrasts we see with PRIAS™ are phase, orientation, and topographic. To capture these, we also have a mode where 3 pre-defined regional detectors are collected during EBSD mapping, and the resulting images available with the EBSD (and simultaneous EDS) data. Figure 7: PRIAS™ Top Detector Image. 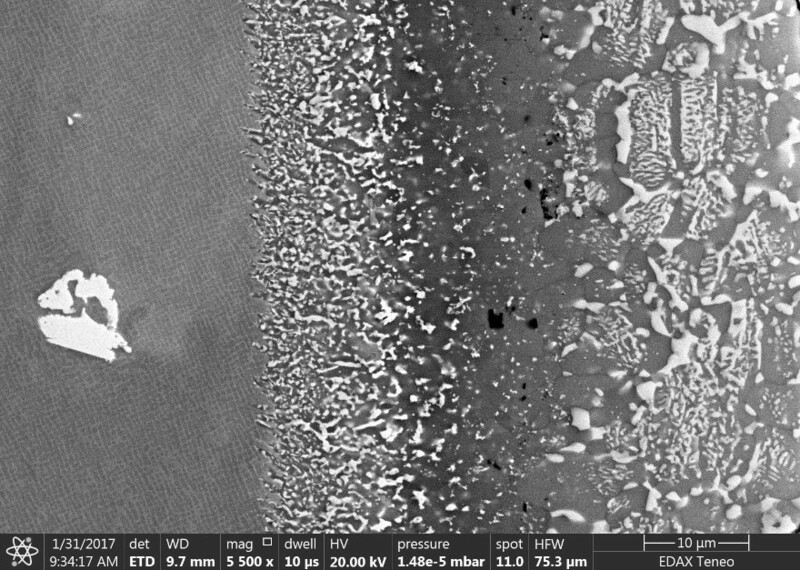 The first ROI is positioned at the top of the phosphor screen, and the resulting phase contrast is very similar to the contrast obtained with the ETD and ABS imaging modes on the SEM. Figure 8: PRIAS™ Center Detector Image. The second ROI is positioned at the center of the phosphor screen. This image shows more orientation contrast. Figure 9: PRIAS™ Bottom Detector Image. The third ROI is positioned at the bottom of the phosphor screen. This image shows more topographical contrast. 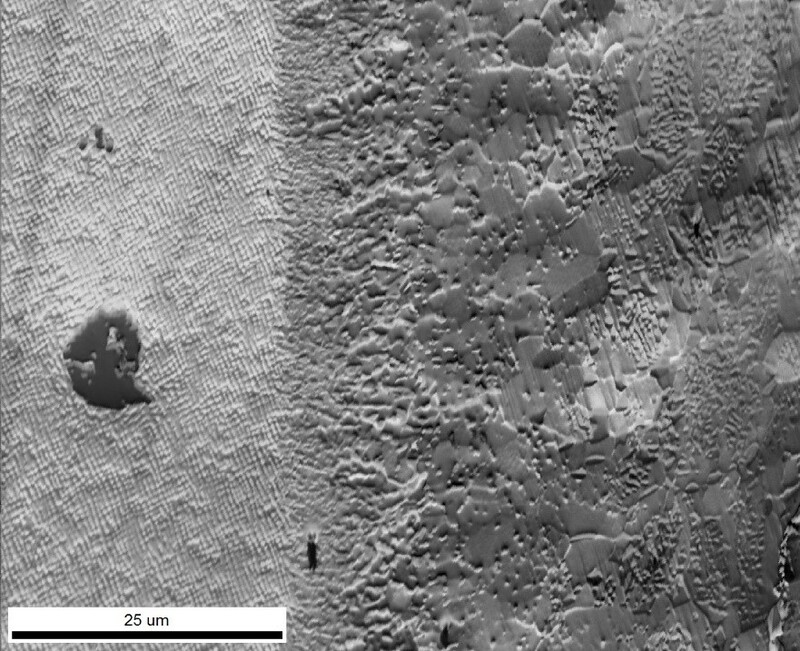 All three of these images are complementary, both to each other but also to the different SEM images. They all give part of the total picture of the sample. Figure 10: Defining Custom ROIs in PRIAS™. With PRIAS™ it is also possible to define custom ROIs. In Figure 10, 3 different ROIs have been drawn within the phosphor screen area. The 3 corresponding images are then generated, and these can be reviewed, mixed, and then selected. In this case, I selected an ROI that reversed the phase contrast, like the contrast seen with the T1 detector in Figure 4. Figure 12: PRIAS™ Center Image with Orientation Map (IPF Map Surface Normal Direction). Of course, the PRIAS™ information can also be directly correlated with the EDS and EBSD information collected during the mapping. Figure 11 shows an RGB EDS map while Figure 12 shows an IPF orientation map (surface normal direction with the corresponding orientation key) blended with the PRIAS™ center image. Having this available adds more information (via contrast) to the total microstructural characterization package. I look forward to using our new SEM, to develop new ideas into tools and features for our users. I imagine a few new blogs posts should come from it as well!